(2015 Jan/Feb Trade) Otter�s climb to the top of Flint Ridge gets interrupted. The heat was miserable. It was sticky and hot, even so early in the morning. The sun had barely peeked above the trees and already, Otter was sweating. He�d been climbing since first light. Even his hands were sweaty. He was grateful for the leather straps around his hands, as well as for the silken towel he kept tucked into his waistband. The straps helped to absorb the sweat and keep his fingertips dry, but sometimes he needed the towel. The humidity was thick, and he knew it would rain in the next day or so. He was determined to reach the top of Flint Ridge before the end of the day; who knew how it would rain once it started? He wanted a good climb in before the weather changed. **Otter, are you all right up there? ** Starskimmer�s send reached him. He groaned. He knew she was just checking in on him, but he wanted to climb in peace and silence, with no sounds save those that occurred naturally, such as his breath, the call of the eagles, or a rush of wind. He knew, though, that if he didn�t respond, she would only continue to send to him. **It is hot and sticky, and I�m great; just not in the mood for interruption,** he replied honestly, though not unlovingly. He sensed her acceptance of that through their connection, and then she was gone, back to her work in and around Bluestone Cave. They had been there for a few days already, along with his father and half-sister, as well as Crackle, Newt, Evervale and Suddendusk. Much had been gathered already, and Otter was taking a day to himself. Part of him thought he ought to be down there now, hunting to help build up even more stores of food, but the rock faces had been beckoning to him ever since the winter the Fierce Ones had returned, and he had finally carved out the space to climb. It was his first time on this particular ridge. His mother had encouraged him to go ahead. The others were encouraging as well. He thought Crackle might have wanted to come, but he had made it clear that he wanted to do this by himself, and hadn�t even asked her. Otter turned his attention back to his climb � it was becoming more difficult. The next series of holds were a bit more spread out, and Otter held on where he was, leaning back so he could look even further upward. It was not going to get any easier. Parts of the route would require some long stretches, and he couldn�t tell for sure, but there was one spot where he might have to lunge for the next hold. Deciding to take it one grab at a time, Otter took a breath and continued upward. Around midday, Otter saw a much-needed respite in the form of a small ledge. He placed his left hand on it to use as a hold, then worked his way over it and turned to sit down. The fisher breathed heavily, wiping sweat from his brow and taking a sip of water. He leaned forward and looked down toward the base of his ascent and whistled. It was quite a long way down � it was possibly the highest climb he had done yet, and he wasn�t quite at the nearest spur of the ridge. Otter took a travel cake from his climbing sack and took a bite. As he looked out over the valley and lands in front of him, he smiled at the sight of eagles in flight, then looked even further, toward the horizon. What he saw cooled him off � there were very dark clouds in the distance, and they seemed to be moving in quickly � the storm would arrive a lot sooner than he or the others had realized. **Mother? ** he sent, concern for her and the others shading his thoughts. **Are you all right? ** she asked. He knew she was right, but he wanted to reach his goal. He looked over his shoulder and upward. It wouldn�t take that long. **I could....** his mother�s offer began. He sensed that she was shaking her head at his stubbornness, but he knew his mother accepted it. **I�ll be down soon as I can. Wait for me? ** With the weather turning quickly, he felt better knowing someone else was waiting for him � and knowing that if he fell, she would be there to help him, even if by simply ordering Muckabout to wrap him. **Of course,** she responded, indicating that she would not be going anywhere until she knew he was safely on the ground. A flash of lightning in the distance startled him, but he didn�t let go, only worked that much faster to pick the next move. Only after two more steps downward did he hear the thunder. Otter took a breath, reminding himself that rushing could be deadly. Stubbornness would only prove him foolish, so Otter agreed. He would have been much further up the ridge if he�d taken that route for starting his climb, but he had wanted to see how far he could get from the base. Still, he was glad in this instance that the bolt hole was available. It would be much easier, and much faster, to go there as opposed to trying to reach the ground. It also had the added benefit of a rope being stored there � if he made it there fast enough, he might use that to complete his adventure by sliding down it. He said as much to Starskimmer. He groaned aloud as he stretched toward the next foothold. He hated it when she talked to him like he was a cub. Part of him wanted to beat her to the bolt hole so that he could take the rope and use it before she could stop him. Another flash of lightning made Otter scan the rock face. He could see the bolt hole now, and knew that he could make it there with a few more moves. Thunder sounded before he reached the next hold. The storm was almost upon him. A cool wind brought chills to his sweaty skin, and Otter knew the rain would start before he reached his destination. He saw a hold he could jump for, which would make his traverse faster; without overthinking it, Otter jumped. For a moment, he wondered if he had misjudged the distance, but then he felt his hand grab around a rocky prominence, then felt his foot reach a ledge. Otter breathed a sigh of relief, then felt the first drops of rain. 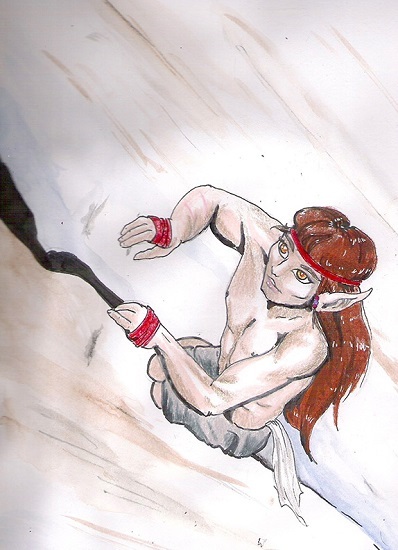 He looked for another point to jump to, but not finding one, scrambled across the rock face toward where Suddendusk was now standing. Otter smiled at the inventor, thankful for the compliment beneath the chastisement. The rockface was getting slippery because of the rain, and Otter was getting soaked. **You�re almost here,** Suddendusk encouraged him, reaching his hand out. Otter wanted to beam with pride � he was happy that Greenweave had such confidence in him. As he and Suddendusk neared the bottom of the stairs, Otter saw Greenweave put an arm around Starskimmer. Otter was happy that both his parents had been there. On the ground, they gave him a hug. �I was worried for a moment or two,� Starskimmer admitted. �I didn�t mean to cause you concern. You know I�m good at this, right?� he asked. Otter nodded. He would definitely consider the weather better in the future; he was just happy there would be a next time.